During their time together they have had the honour of Led Zeppelin’s front-man Robert Plant attending three of their gigs and John Bonham’s son Jason even jammed with them on stage. These things the band are very proud of. It must surely also be the best recommendation any band could receive, and also assure any Led Zeppelin fans apprehensive about seeing The Fredz. According to one of Kerrang’s readers polls. 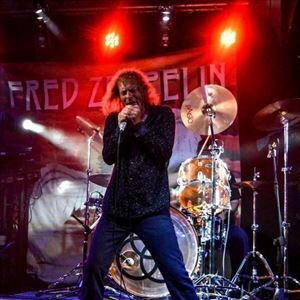 FRED ZEPPELIN are among the top ten best live bands to see. Quite an achievement, as they were the only tribute band listed in any category. Its worth taking a camera with you, as you don’t know who could be standing next to you. In the audience have been MAGNUM’s front-man Bob Catley, WHITESNAKE’s guitarist Mel Galley. Roy Wood legendary main man of THE MOVE & WIZZARD, and SLADES Jimmy Lea was the latest rock celebrity to experience a two-hour Fred Zeppelin gig. Fred Zeppelin were invited by Led Zeppelin’s Jimmy Page to attend a charity event of which Jimmy is a patron. Kev (bass) and Blackie (drums) attended and were thrilled to meet and chat with the legendary guitarist. Also at the party were Roger Daltrey, Julian Lloyd Webber, Leo Sayer and Formula One’s David Coultard. What a night !! Fred Zeppelin are real fans and formed ‘The Freds’ out of their admiration ]and love of Led Zeppelin’s music. As their name the band do not take themselves too seriously, they know the praise belongs to Robert, Jimmy, John Paul Jones, and Bonzo.